Nothing is as enjoyable as spending a beautiful day outdoors. It’s only more enjoyable when that beautiful day is spent outdoors on your gorgeous deck overlooking your beautiful view while lounging on your outdoor sectional or even enjoying an evening roasting marshmallows with the kids on your outdoor fire pit table. It’s all this and more than makes having a large and inviting deck so appealing to so many homeowners. If you already have a deck, you know how. If your deck is not in stellar condition, however, it can seem far less inviting. Before you begin thinking of the expense of a brand new deck in your future, it’s time to consider deck refacing. The professionals at The Window Broker know that your existing deck is in perfect enough condition to simply reface it and give in a brand new look without a brand new price. Why Reface My Current Deck? An old deck that might not be in the best condition is not always worth tearing down. Old materials might not be to your liking, and it might not be precisely what you want. However, our decking professionals can breathe new life into an old deck and turn it into something spectacular. Our experts can reface your deck to make it look brand new. We can add a railing, change your existing railing into something more modern, and we can even add planters and other features to help make your deck look even better than it did when it was first built. Once you call us to discuss the refacing concept, we send our team of experts out to take a look at your existing deck. Once we take measurements and see what it is you want and what it is you are looking for, we are capable of providing you with a blueprint, materials and an estimate. Our professionals can tell whether or not a deck needs minimal work and just a new face, or if it might need a bit of structural work to make sure it is safe for your family. Additionally, we also offer our customers a full-service package. We not only come out and consult and reface your existing deck, we also clean up when we are finished so that we leave your deck looking brand new and your yard looking as if no one has ever been there. 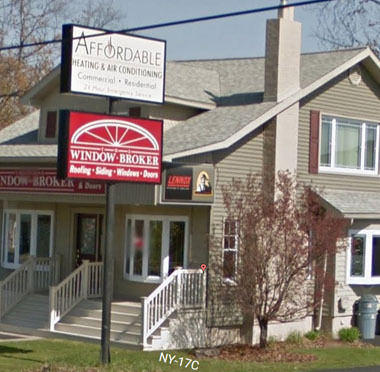 At The Window Broker, we value our customers and their satisfaction with our work. Call us at The Window Broker today at (607) 798-9954 or fill out the online form on this page to schedule a free consultation. Our deck experts will come to your home and assess your current deck to get an idea of what we are working with. We will answer any questions you have, offer any advice you are seeking and make sure that you enjoy the process as a whole.